All transactions are safe and secure with a reliable history in online purchasing behind each of our associates. Buy the Waiting for Loves True Kiss t-shirt to own Snow White clothing and merchandise. 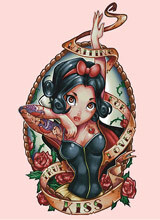 Where do you find the brown eyed beauty on this Snow White tee? According to the Wicked Queen's Magic Mirror, "Over the seven jeweled hills, beyond the seventh fall, in the cottage of the Seven Dwarfs, dwells Snow White, fairest of them all." She spends her time tending the home, picking wildflowers, communicating with the animals and singing with the birds until she is tricked into eating a poison apple. Then she must lay and wait until her Prince Charming rides in on his white horse and graces her with a kiss that wakes her from her slumber. What a happy ending for a lovely lady. In addition to the Waiting for Loves True Kiss tee above, browse the Snow White Clothing Gallery for more apparel like men's and women's clothes, kids shirts or hoodies.